Hockey Abstract is a must-read guide for anyone interested in learning more about statistical analysis in hockey. But instead of reading like a dry textbook, Hockey Abstract is a fun-to-read, page-turner that reads like a book (there are even moustache jokes). Vollman has the rare ability to write about stats in a conversational tone, yet still provides enough detail to make the concepts understandable. To do so, Vollman goes about answering 10 questions—most of which you've probably argued about at the bar—including who is the best player, goalie, and coach. In another chapter, GVT, the hockey equivalent to baseball's all-encompassing WAR statistic, is used to rank the most lopsided trades in NHL history (spoiler: Mike Milbury makes multiple appearances). Then, Vollman puts his prognosticating powers to the test and predicts how next season's standings will look. Vollman is quick to point out that his answers are not meant to be definitive, and writes, "I love hockey arguments―I want to refuel the conversations, not end them!" In fact, throughout the book Vollman attempts to explain the limitations of many of the statistics he describes—because, like any other sport, there is no infallible metric that explains everything. For example, Vollman is quick to point out that, although tremendously important, Corsi and other shot-based statistics are heavily context-dependent (e.g., a player's linemates, his opponents, and his role on the team can all affect a player's Corsi). One of the ways context is fantastically described is through Player Usage Charts, which represent the types of minutes a player receives in visual form. Below is an example courtesy of HockeyAbstract.com. 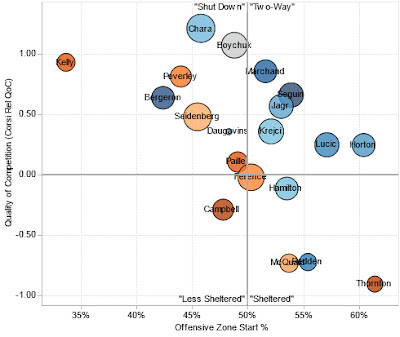 The horizontal axis represents the percentage of shifts a player starts in the offensive zone. The vertical axis represents the quality of competition of a player's opponents. So players on the top left of the chart start most of their shifts in the defensive zone and against tough, top-line competition. Although Hockey Abstract is comprehensive, one problem for those just beginning to venture into the initially-intimidating world of analytics is that the first few chapters are filled with references to various statistics like Corsi and GVT, which don't get their own devoted chapters until much later. For those who are already familiar with these concepts it is easy to jump right in, but the uninitiated may find themselves starting the book mid-way through before doubling back with the knowledge to fully appreciate the initial chapters. But even with that slight drawback for new students, the concepts are explained in a way that makes them very easy to understand, and Vollman uses lots of examples to hammer his points home. In part, the concepts are accessible because everything is equated to goals and wins. And it isn't hard to see why goals and wins are important in hockey. Almost everything in the book is Vollman's own original work, and there are over 150 references to studies done by other people, so it truly is a great place to start on your journey to greater hockey knowledge. Many times reading I had to stop and check a reference because—nerd alert!—I was fascinated by the concept and wanted to learn about it in greater detail. And contrary to popular belief, the use of these stats doesn't mean the need for watching hockey—you know, the most enjoyable thing about being a hockey fan—is obsolete. Vollman sees a world where stats and scouts can come together as one. "It's also important to remember that statistical analysis was never meant to replace anything, and no one in this field has ever suggested otherwise―probably because that would be unmistakenly ridiculous. This type of objective analysis makes an excellent companion to the more traditional ways of studying the game and never has, and never will, act as a replacement." In fact, San Jose Sharks scout Brian Gross recently explained that the Sharks use Corsi to evaluate junior players. And Kyle Dubas, the young GM of the Sault Ste. Marie Greyhounds of the OHL, is a vocal proponent of using advanced stats to complement traditional ways of looking at the game. And if that doesn't convince you to pick up Vollman's book, old-school hockey fans will appreciate that Vollman describes the shootout as an "arbitrary and essentially random skills competition". Amen. You can purchase Rob Vollman's Hockey Abstract in paperback from Amazon, or as a pdf here. I thoroughly enjoyed Hockey Abstract and certainly recommend it to anyone curious about a more objective approach to hockey or who would like a one-stop guide to the burgeoning field of advanced statistics in hockey. I really enjoyed The Hockey Abstract. I am new to some of the advanced analytics Vollman used, but the explanations are terrific and make them understandable even to a non-stats geek. Lots of fun to see these methods applied to both current players and some of the greats from past years. The book also discusses some historical events, like trying to find the most lopsided trades in NHL history based on the performance of players on their new clubs, and even trying to determine who is really the best coach in the NHL, both in terms of active bench bosses and through the league's history.